Shelving constitutes a key element of most modern materials handling systems because it offers the simplest, most economical way to efficiently organize, store, retrieve and display goods. The advantages of structural wood panels make them ideal shelving materials for many situations. They are also one of the most economical shelving materials because the grade and thickness can be selected to match the particular application. In situations where the load will be heavier, thicker panels can be chosen. Lighter load situations won't require as much support, so less expensive, thinner panels can be selected. For best results, use a carbide tipped Alternate Top Bevel (ATB) saw blade with 60 teeth for a 7-1/4 inch blade or 80 teeth for a 10 inch blade. Adjust the blade to extend through the panel at least 1/2 inch. Cutting teeth should enter the face of MDO plywood. Backing the panel with scrap material and feeding it through slowly helps avoid chipping. In most industrial applications, no special edge treatment is required for structural panel shelving. However, for appearance, or uses where panel edges may need protection from careless loading procedures, edges may be chamfered or protected with stock wood half-round or standard metal or plastic edge banding. Because structural panels are real wood, they will accept any standard wood finish if the surface is clean and the manufacturer’s directions are followed. For durability on frequently cleaned surfaces, use washable enamels or high density overlay (HDO) plywood. In situations where panel shelves may be exposed to unusual edge damage or abrasive wear on their surfaces, they can be economically covered with expendable hardboard, thin sheet metal or other protective surfacing​. While used in a broad range of commercial and industrial structures, mezzanine floors are most often designed to support heavy loads. In addition, the mezzanine may be required to carry pallet jacks or carts so that unused overhead area becomes low-cost working warehouse space. Finish flooring will vary with anticipated use. In some cases, bare panels have proven satisfactory. However, a wearing surface should be provided to resist crushing of floors subject to hard wheel or caster traffic. An expendable layer of panels or a dense wear surface, such as tempered hardboard, should be used if wheels are small, hard or heavily loaded. 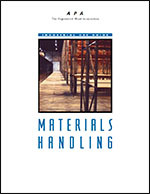 This publication provides descriptions, specifications, and fabrication instructions for pallets, pallet bins, liquid tanks and bins, crating, and shelving. 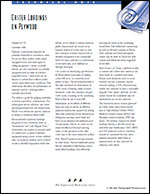 This data file provides recommendations for the installation and preparation of underlayment under finish flooring in residential and light commercial applications. 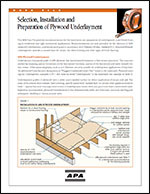 This technical note provided recommendations for specifying plywood floor products under small wheel (caster) vehicle loads in industrial and commercial environs. 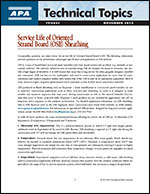 This technical topic provides guidance on the performance and proper specification and application of OSB products.